Uber Technologies Inc. is a global technology based taxi-hailing service company, founded in the year 2009 in San Francisco, USA. 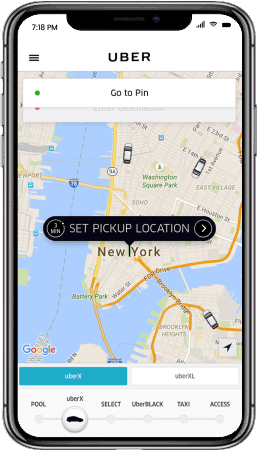 Currently operating across more than 633 cities, Uber is a trend setter in so many ways. It's undoubtedly the global leader in its segment (except China ofcourse). It's also one of the world's biggest tech companies with billions of dollars in revenue every year. And it's a perfect example of how tech-startups have conquered the world in the last 5 years. Uber uses locations of the customers & connects them to the nearest available drivers. Once a driver accepts the ride, his info is sent to the customer who can track the vehicle in real time. And once the ride is over, you can pay using the various cashless methods available or by cash as per the country you are in. With Uber, there's always a variety of rides to choose from; from pool taxis & low cost vehicles to luxury taxis & even bikes in some of the countries. If we go into the details, Uber has two apps... one for the customers & another for its drivers. While the customers do pay for their rides as per the current rates, signing up with Uber is free for drivers. Variety of cars: UberGo, UberX, UberMoto etc. Need a cab booking app for your business? We believe we have the right experience to help you with the same. App Design: To captivate the users’ imagination & attention, a simple yet powerful app design plays a vital role. App Platform (Android, iPhone): App development costs vary from platform to platform. It all depends on how quickly you want to get it started. App size: This refers to how heavy your app is on your mobile phone & its performance. A heavier app is more likely to be rejected by people from the developing/underdeveloped countries. Need a Taxi Hailing App of Your Own? Andolasoft, a global web & mobile apps development company based out of San Jose, CA, USA with an offshore centre in India can help you develop an Uber like app in quick time.